Since we got to London, I've had a fascination with the Tube. It's unlike anything in New Zealand: It's a train, and it's underground. NZ has a few trains (few being the operative word), but none of them go underground, not really. The system here really is quite amazing. It moves around 3.5m people a day - yes, nearly the population of New Zealand PER DAY. Having been in it during rush hour, I can believe that. That said, overall, it's a very pleasant and efficient service. Sure, bits break down now and again, and a bit more room in the carriages would be nice, but I'm not complaining*. In general, trains turn up fairly often (1-10 mins since the last one, depending on the day), and go where they say they will. The cost isn't excessive, either (around 100 GBP for a month pass for all trains, tube and buses), tho it does feel like a lot sometimes. With the flexibility of the tube, however, we seldom need a car, so by comparison, it's cheap. *I'm especially not complaining now, as I either walk, or catch the bus, to work. With the addition of some fairly indispensable iPhone apps, especially if your eyesight isn't too good (iPhone voiceover + London Travel app = usable bus network by visually impaired people), the whole London travel network is, generally, a delight to use - at least by someone not used to having any public transport at all. .. but I'm always intrigued as to where I am, why this bit when around that corner (and not just a straight line) etc. 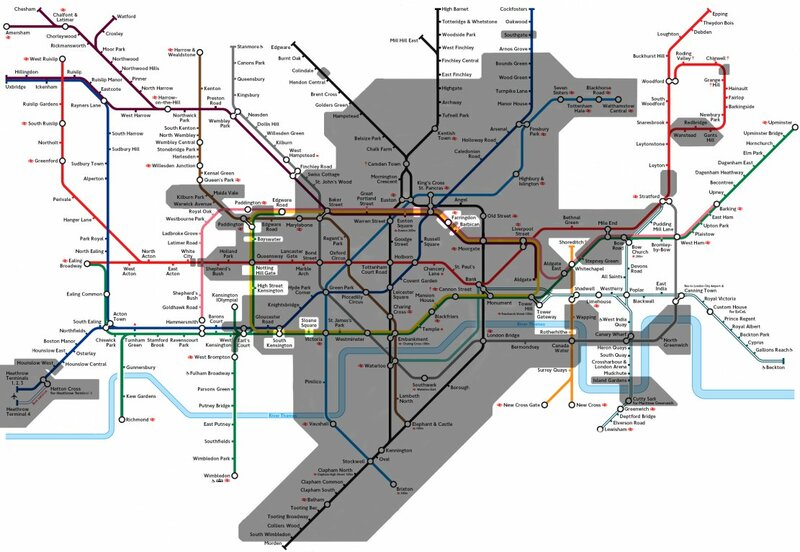 So this map, via Urban75, is really one which I find very useful. It actually details where the turns are, why we just went around a certain corner, and how the platforms - underground - relate to each other. It's geeky as all hell, and I'm not a train-spotter by any means, but I find it really interesting. It even has bits like Mill Hill East, which is at the top east side of the Northern (black) line. The Mill Hill East spur was going to connect up to Edgeware (the top of the west side of the Nothern line), but they never finished the line for some reason. There is even a PDF if you have a fast enough machine to render it. Londonist has a nice guide to all the various alternative maps, too - some are just silly, but a lot are very useful.